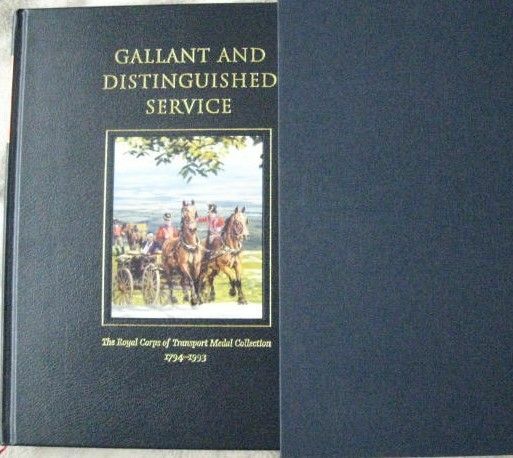 First edition, first print slipcased hardback of GALLANT AND DISTINGUISHED SERVICE: The Royal Corps Of Transport Medal Collection 1794-1993 by David Owen and published by the Trustees of the Royal Army Service Corps and Royal Corps of Transport Institution in 2006. The book is in near fine condition (black leather boards with gold lettering to spine and front with a small illustration) with no significant wear. The slipcase (dark blue cloth boards) is also in near fine condition with no significant wear. Internally, the pages are clean and tight and there are no tears and no inscriptions. This book traces the origins of the Royal Corps of Transport, from the Georgian Royal Waggon Train to the Army Service Corps of the First World War and the Royal Army Service Corps of the Second. It testifies the importance of these organisations, but also examines the many deeds of gallant and distinguished service by their members, using the Royal Corps of Transport medal collection as a basis. 306 pages, including black & white and colour photographs, maps and illustrations, plus Foreword, Appendices, Glossary, Acknowledgements and Sources, List of Subscribers and Index.